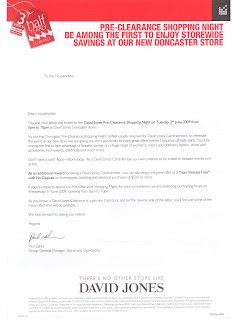 Recently, on the same day, two envelopes from David Jones arrived in our letterbox at home. 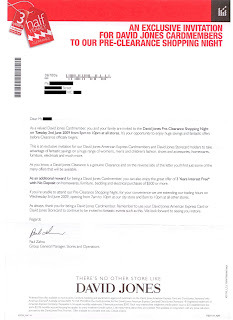 Over the years, my wife has sometimes attended "exclusive" shopping nights for David Jones Cardmembers. But our assumption has always been that an "exclusive invitation for cardmembers" means only cardmembers are invited. Yet on this occasion, DJs clearly also letterbox dropped thousands of households in the northeastern suburbs of Melbourne. On the night, there was nothing "exclusive" about entry to David Jones' Doncaster store. If you showed an invitation - any invitation - you got in. And no roped-off VIP area for cardmembers. So how was my wife's personalised invitation in any sense "exclusive"? This isn't about whether cardmembers are forced to mingle with the riff-raff on a promotional shopping night. It's about stupid and disingenuous - and possibly misleading and deceptive - promotion on the part of David Jones. Discovering that a trusted brand has engaged in such behaviour can be a powerful influence in undermining customer loyalty. And isn't brand loyalty the reason why stores like DJs have store credit and cardmember programs in the first place?